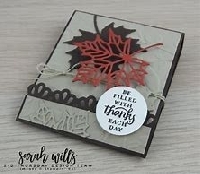 I did this a while back and it was so much fun and they turned out so pretty I thought it would be a great swap, very simple to make and then you decorate anyway you like, these wonderful little notepads are great for any purse, the car, work or gifts. you will make 1 decorated matchbook notepad for one partner. SENDERS Choice, and I know you will all do something amazingly creative and pretty. Decorate your notepad with any Autumn embellishments you would like. Senders choice-this is not profile based, so you can start right away. check out some website sites pin interest or youtube **Size - its roughly about 3 3/4 x 4 , this is not an exact measure. Use your imagination and creat a lovely Fall embellished Matchbook notepads make it something you would love to receive.